[Photo] Zalophus californianus californianus (California Sea Lions), at Monterey Breakwater, California.Date 05/05/2006. Author David Corby. A sea lion is one of many marine mammals of the family Otariidae. Sea lions are characterized by the presence of external ear pinnae or flaps, long front flippers, and the ability to walk on four flippers on land. They are generally found in shallow waters of coastal areas of both northern and southern hemispheres, with abundant food sources. 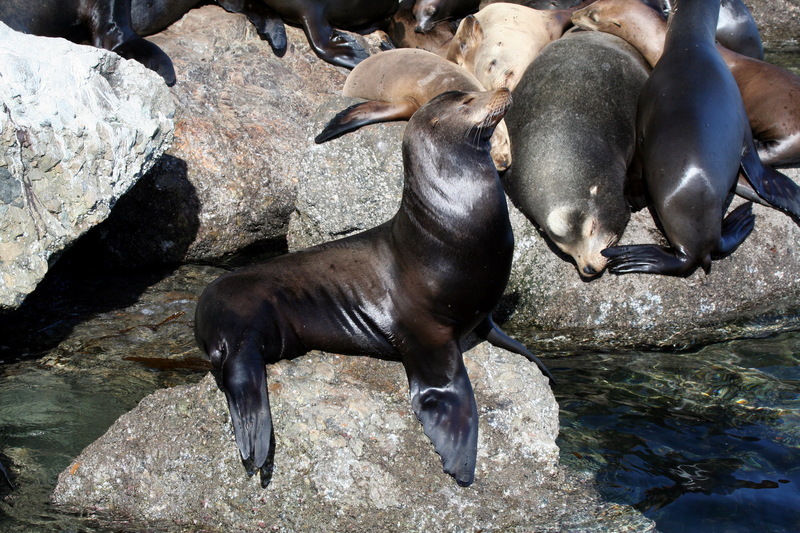 A hybrid sea lion from a cross between the California sea lion (Zalophus californianus) and the South American sea lion (Otaria byronia) has occurred. The government of Japan has set a quota of 116 kills per year in Hokkaido, as sea lions are seen as a threat to commercial fisheries. International environmentalists and local fishery advocates continue to debate the issue. The Norwegian government has set a quota of 200 kills per year. Sea lions have been trained by the U.S. Navy's Marine Mammal Program, based in San Diego to detain scuba divers. Sea lion attacks on humans are rare, but have occurred in at least a single notable case, in which a 13 year-old Australian girl was attacked while in the water. Sources said that the likeliest explanation was that the animal was attempting to play with the girl. The Moche people of ancient Peru worshipped the sea and its animals. They often depicted sea lions in their art.